The third generation of our best-selling small CNC mill. 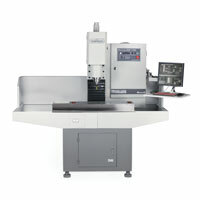 PCNC 1100 Series 3 combines quality components with thoughtful engineering. Includes PCNC 1100 and essential workholding, tooling, and other accessories to get started. Nicely outfitted and a great starter kit for prototypers, small shops, inventors and home hobbyists. 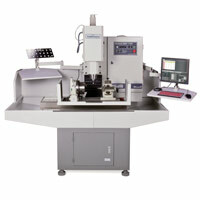 Includes all the equipment necessary to machine at a professional level and designed with the machinist in mind. Get started making parts with the Part Maker package, which includes all the tools necessary to outfit a new shop. The PCNC 1100 personal CNC mills are our best selling small CNC milling machines and a proven performer for prototyping, short run production, education, and hobby CNC milling. Thoughtful design and engineering makes the Tormach personal CNC mill an unrivaled combination of performance and affordability in its class, with the precision to do real work and power to cut the toughest materials – stainless, titanium, even pre-hardened tool steel. With Tormach it is possible to build your CNC shop any way you like! Our packages are a few examples of how you can configure your PCNC 1100 and accessories to work for you. Using our shopping cart, you can add or subtract items from the packages to create your own custom equipment list. The Tormach PCNC 1100 personal CNC mill is a new approach in CNC milling machines – a small CNC mill designed for real work with the power to cut serious materials. Milling circuit boards, aluminum, and engineering polymers are a breeze when your CNC milling machine is built to cut materials like steel, iron, stainless, and titanium. 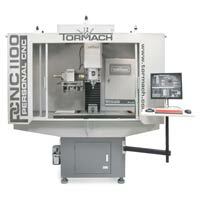 PCNC 1100 personal CNC mills were engineered from the ground up to be the best value in small CNC milling machines. The Tormach PCNC 1100 personal CNC mill was thoughtfully designed with a combination of quality components and proven technology to create an affordable small CNC milling machine that provides unprecedented value in CNC mills. The machine is capable of cutting most materials at or near their recommended feeds and speeds. For example, for fast metal removal on 6061 aluminum we will run a 1/2” diameter 2 flute cutter at around 18 IPM (inches per minute) and 3000 RPM, using a full 1/2” depth of cut. That’s a pretty good volumetric rate of metal removal so it’s essential to clear chips with a flood coolant. We will run smaller cutters when we’re not trying to remove large amounts in a hurry. For most aluminum work we use 3/8”. The example above, using a 1/2” cutter, results in a surface speed of 390 SFM (surface feed per minute). A 3/8” cutter needs 4000 RPM to get the same surface speed, well within the performance envelope of the machine. When it comes to customizing your PCNC mill Tormach leads the way in available options. Build the perfect cnc machine for your particular need with a wide array of PCNC mill upgrades and add-ons. From enclosures to ATC’s and Power Drawbars, get the options you need for your shop. 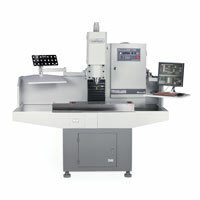 5140RPM 1.5HP R8 Spindle with Sensorless Vector Control and exclusive foldback logic. Each PCNC 1100 CNC mill has over half a ton of cast iron and steel that is precisely placed to achieve maximum frame rigidity in a footprint that’s about the size of a traditional manual milling machine. The sliding dovetailed ways are hand-scraped and designed to withstand high loads and dampen vibrations. The ways have bonded PTFE filled acetyl sliding surfaces, hand scraped by skilled machine builders. Similar to brand name compounds such as Turcite® or Rulon®, PTFE compounds provide low friction and long life. Each PCNC 1100 small CNC mill features an R8 spindle with a 3 3/8″ nose diameter – the same standard dimension as popular Bridgeport -style manual mills. This can be used in combination with the innovative quick-change Tormach Tooling System® (TTS) or any generic R8 tooling. The Deluxe Machine Stand has been designed to maximize efficiency of your PCNC 1100. Chips and coolant stay contained with its generous tray depth, back and side guarding. The table mounted guard shields in the forward direction, while the integrated coolant system keeps you running at maximum speeds and feeds. Shown with the PCNC 1100 mill (not included). The Tormach Tooling System ATC is a 10 tool carousel-style automatic TTS tool changer for the PCNC 1100 and PCNC 770 Mill. The side mounted changer integrates with our existing power draw bar system to automatically change tools via controller command. The Power Drawbar integrates with your PCNC Mill for lightning-fast manual tool changes with the push of a button and eliminates the need to hand-tighten your drawbar. To change tools, a pneumatic multi-stack air-over-air cylinder is actuated to depress the drawbar, releasing clamping pressure and opening the collet without putting harmful load on the spindle bearings. When the cylinder is released, the drawbar tightens and the tool is held firmly in place. This system provides over 2500lbs of holding force to the tool. Tormach offers 6″ and 8″ standard and tilting rotary tables and 4-axis CNC kits for the PCNC 1100 personal CNC milling machines. The 4-axis CNC packages integrate with the PCNC 1100 CNC mill’s control system and include the motorized rotary table, electronic driver modules and wiring harnesses. The motorized rotary tables included with the 4-axis CNC kits are designed for CNC machining operations that involve large forces, cutting fluids, and frequent operation. The rotary tables are direct drive and totally sealed. Turn your Tormach PCNC mill into a CNC Lathe for small parts with the RapidTurn™ chucker lathe accessory. RapidTurn’s space saving design provides real CNC lathe functionality and one setup for turning and milling. The lifting bar is an accessory used for hoisting a PCNC mill, primarily for the purpose of placing the mill on a stand. When installed properly it provides a lift point directly over the center of gravity. The set includes bar and all necessary chains, shackles and attachment hardware. Detailed instructions are included with the set. The Spindle Load Meter accessory for Tormach PCNC milling machines offers a way to visually monitor the spindle load of the machine. Tormach offers the option to install a BT30 spindle on the PCNC 1100, and it was designed to be used with most BT30 toolholders and with BT30 drawbar. Automatic oilers make oiling a CNC machine easy, since a small amount is released every few hours to make sure the machine is properly lubricated to help prevent friction-induced wear. Each of the kits sold by Tormach include all the components needed to set up an automated oiling system for your CNC mill, lathe, or grinder. Stop your CNC milling machine up to 10 feet away with the Integrated Remote E-stop Kit. Multiple remote E-stop buttons can be linked together in a series to provide additional emergency stop locations. LOOKING FOR HELP WITH YOUR PCNC 1100 MILL ?